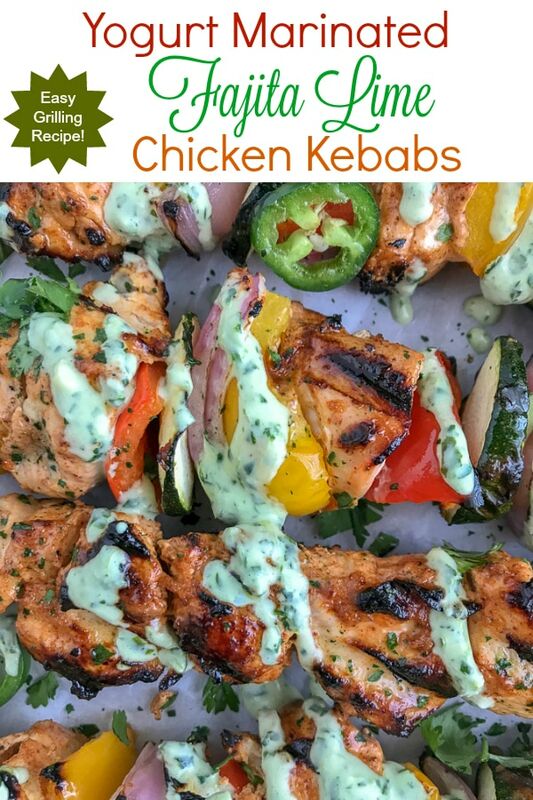 Yogurt Marinated Fajita Lime Chicken Kebabs – marinated in a fajita lime yogurt combination that helps to make them crispy on the outside, yet tender and juicy on the inside. 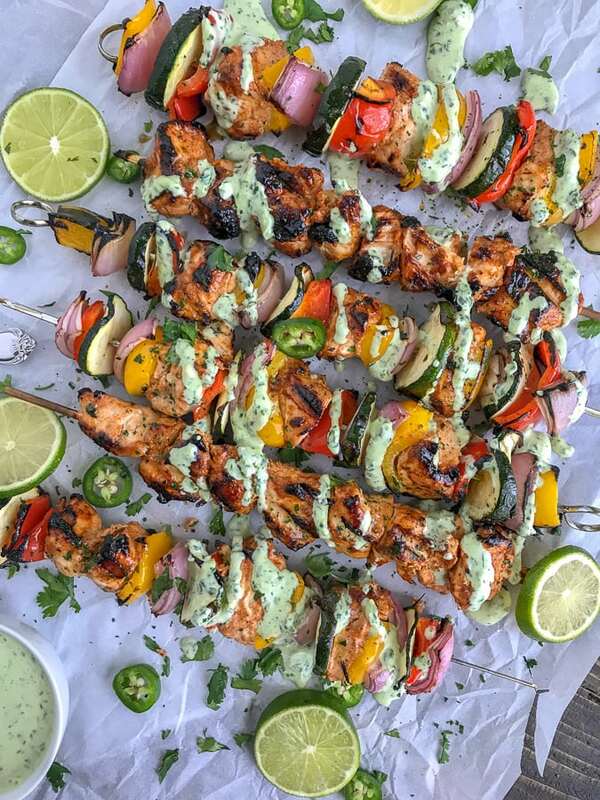 These Yogurt Marinated Fajita Lime Chicken Kebabs are served with an easy-to-make Creamy Cilantro Lime Sauce. Making it the perfect recipe for grilling season, holidays, or for a quick, simple dinner! Or perhaps you’re looking for something flavorful to spice up your chicken prep? Got a party planned for Memorial Day weekend? Whatever the case – this is the recipe for you! 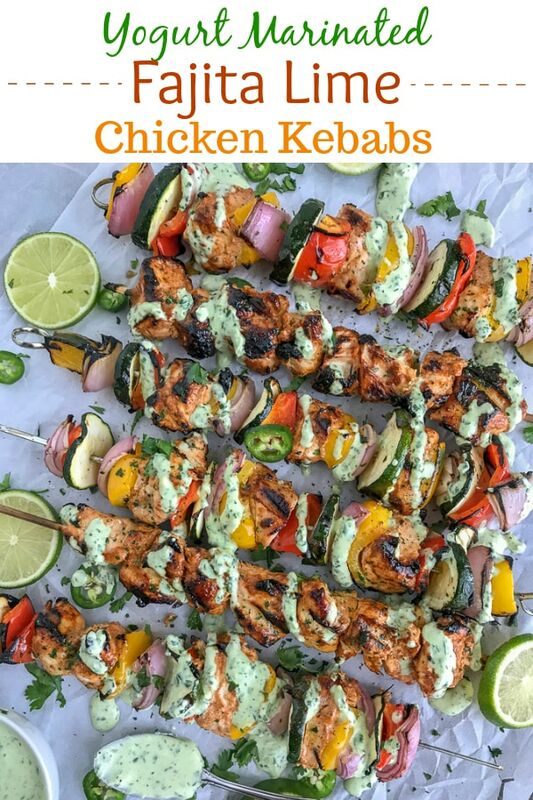 This chicken is not the dry, boring chicken kebabs that you’re used to! They are crispy on the outside, yet tender and juicy on the inside. The fajita lime yogurt combination is to thank for this! Yogurt? Yes, you read that right. Your eyes are not deceiving you. I promise it’s not as strange as it sounds. It’s actually quite the interesting use of yogurt to be honest. I used 2% fat plain greek yogurt for this, as I feel a little fat goes a long way and certainly helps with flavoring. But you’re more than welcome to use whole-fat or non-fat. Yogurt helps to not only tenderize the chicken but it also helps give it some flavor along with the olive oil, lime juice, and fresh seasonings. I tend to enjoy the tartness or sharpness of some foods, so I will add more lime juice, lemon juice, choose a sharper cheese, add more vinegar, and so forth, when I make something. 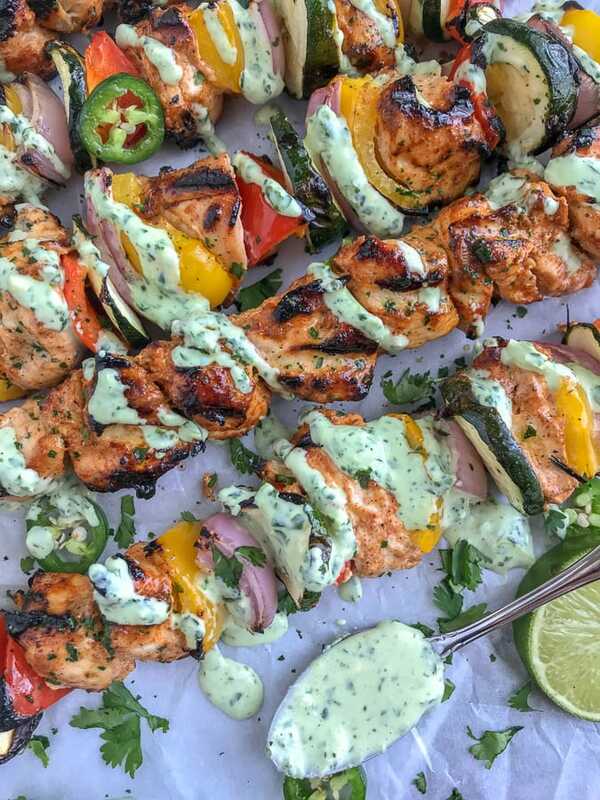 Which is why this recipe combination of the Yogurt Marinated Fajita Lime Chicken Kebabs and Creamy Cilantro Lime Sauce contains lime juice throughout – start to finish. Even a little extra squeezed over the top when it’s finished. It’s very easy to make for how flavorful it is! You can serve this chicken with the vegetables listed or you can pair it with the vegetables of your choosing. I will say the mixture of peppers, onion, and zucchini squash all compliment the chicken and Creamy Cilantro Lime Sauce very well. It’s worth giving it a try! Whatever vegetables you decide to use, be sure to cut the vegetables on the thicker side – but not too thick. Unless you prefer them to be partially cooked, partially crunchy. I don’t like mine to be over-cooked, so I tend to cut mine on the thicker side. If using zucchini (or even yellow) squash, don’t slice too thin. Otherwise you will end up with burnt-to-a-crisp “chips”. HA. Next time I think I’ll make these with corn on the cob as a vegetable option. How delicious would that be?? Or even with mushroom caps! You’re welcome for all of these ideas by the way. The Creamy Cilantro Lime Sauce is out of this world. The taste test process was a struggle. A good struggle, though. Because I was excited to scoop it out of the processor bowl and drizzle it on the kebabs (and well, anything I could!) Yes, it’s that good. It comes together in a food processor very easily and has become a new favorite in this household. I can guarantee that it will for yours, too! You will soon be enjoying it, not only on these kebabs, but on wraps, vegetable bowls, as a dressing on salads – you name it. Between this concoction and my Creamy Cauliflower Alfredo Sauce – I’m in sauce heaven! Chicken thighs are a more tender, juicy cut of chicken. You can swap for chicken breast or do a half and half of chicken breast and chicken thighs. I used thighs and recommend trying this recipe with them. 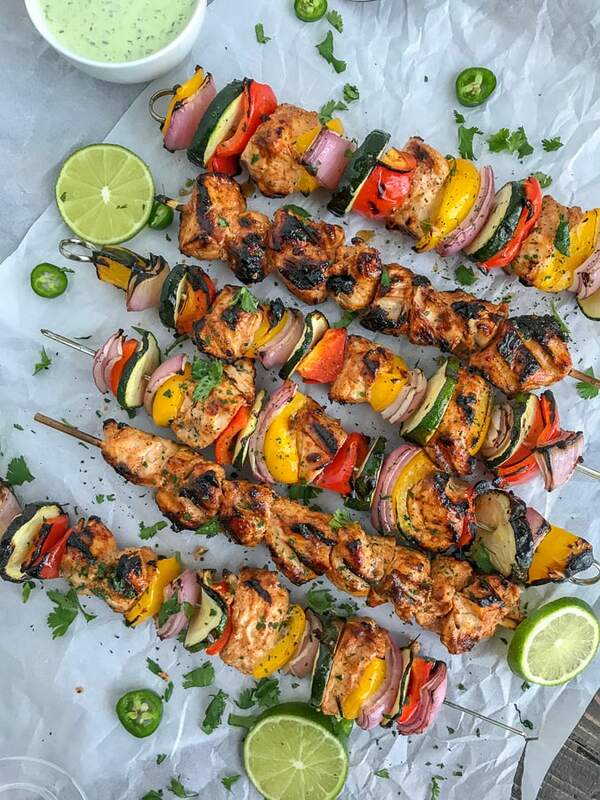 Soak wooden skewers in water 20-30 minutes prior to adding the chicken and vegetables. This will help prevent them from burning or catching fire on the grill. Pressed for time? Marinade the chicken the night before or a minimum of 2 hours. The longer the better. If using zucchini squash, be sure to not slice too thin. They will burn and turn crispy on the grill rather quickly. Be sure to use a high-heat oil, such as canola oil, when oiling the grill grates. 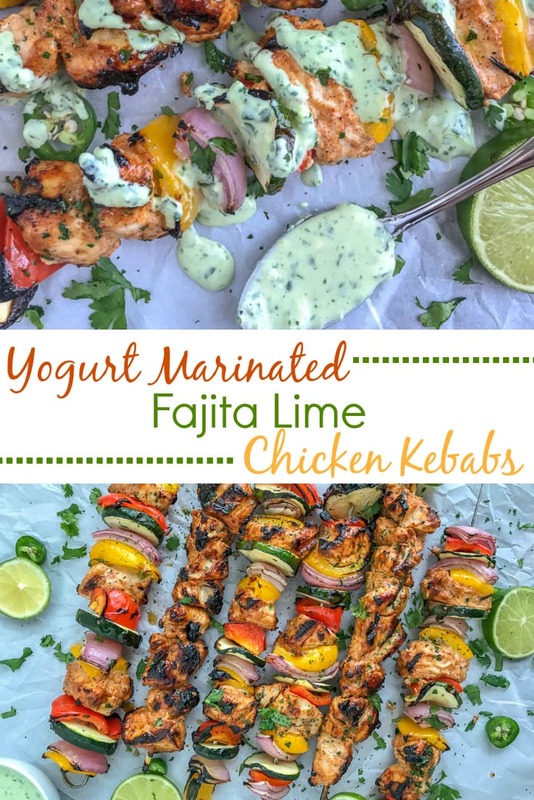 Did you enjoy these Yogurt Marinated Fajita Lime Chicken Kebabs? Try these recipes! 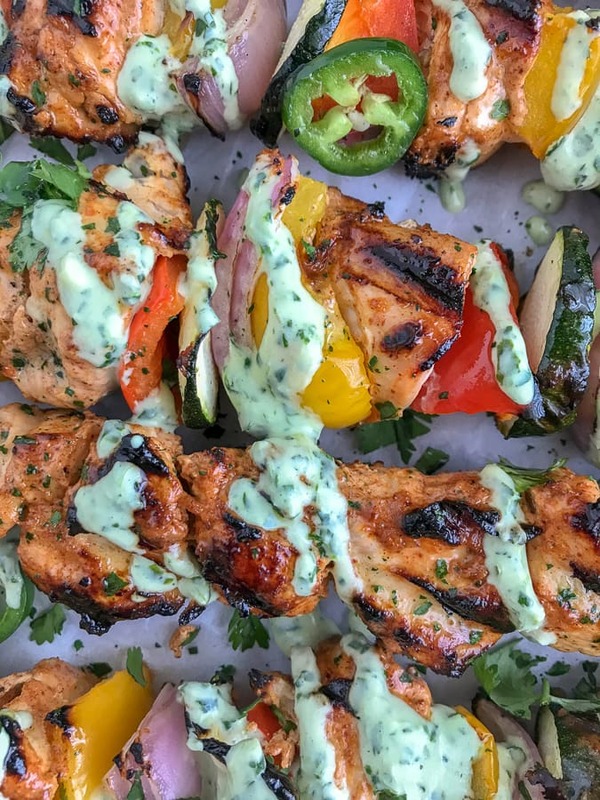 Chicken kebabs marinated in a yogurt lime sauce that help to not only make them tender and juicy, but also extremely flavorful. Easy to make and can be ready in 20 minutes! Cut the chicken into bite-sized pieces and place into a large ziplock bag or storing container. In a small mixing bowl, combine the ingredients for the marinade listed above. Stir well to thoroughly combine. Add to the bag with the chicken. You can either use a spoon to toss the chicken to coat or seal the bag and give it a good shake. Place the chicken into the refrigerator to marinade a minimum of 2 hours to overnight. While the chicken is marinading, prepare the Creamy Cilantro Lime Sauce by combining all ingredients (minus the scallions and cilantro) into a food processor or blender. Puree until creamy. Add in the chopped scallions and cilantro. Process until it reaches a creamy consistency. Place into a sealed container into the refrigerator until ready to use. If using wooden skewers, remember to soak them for approximately 30 minutes prior to using to prevent them from catching fire on the grill. Add the chicken to the skewers, alternating between it and the vegetables, to fill 6 skewers. Preheat the grill to medium-heat. Brush a light coating of oil over the grates. This will help prevent sticking. 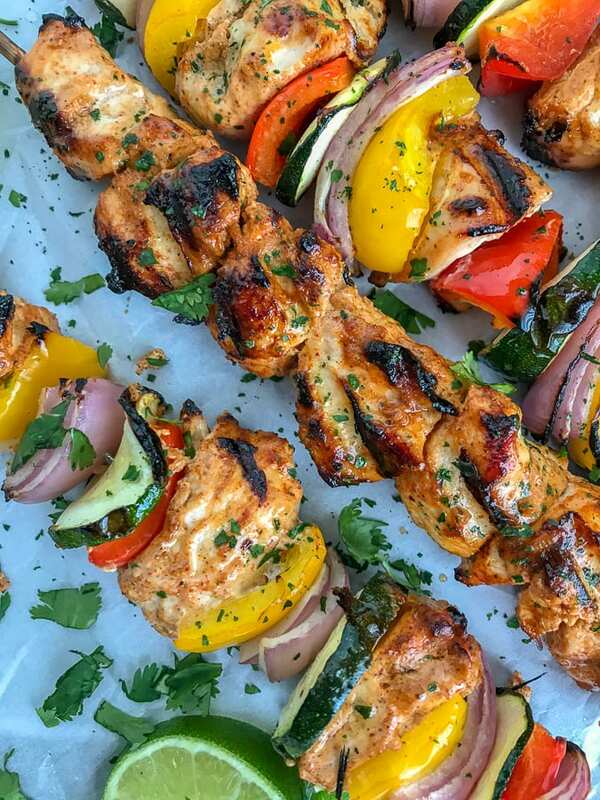 Place each kebab on the grill, cover with lid, and allow to cook approximately 3-4 minutes per side. Cook approximately 10-12 minutes or until the chicken is cooked through (no longer pink on the inside). Remove the kebabs to a serving platter. Garnish with fresh cilantro, crushed red pepper flakes (optional), and freshly squeezed lime juice. Serve right away, garnished with the Creamy Cilantro Lime Sauce. Preheat oven to 450 degrees F. Line a baking sheet with aluminum foil. Add a baking rack to the top of the aluminum foil and spray generously with nonstick spray. Lay each kebab on the baking rack, leaving a little space in between each one to ensure they cook thoroughly. Spray the tops of each kebab with cooking spray. This will help keep them moist, yet also help to give a crispy exterior. Bake for 15-20 minutes, turning halfway through. After they have cooked through, turn the broil on to help brown the outside (optional). Be careful to watch to avoid burning! Serve garnished with fresh cilantro, crushed red pepper flakes (optional), and freshly squeezed lime juice. 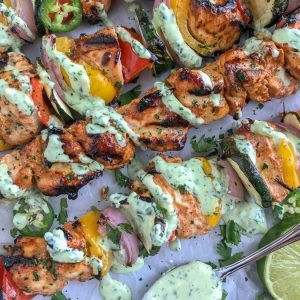 Don't forget the Creamy Cilantro Lime Sauce! Oh my goodness I’m prepping this for tomorrow’s dinner and I can already tell these will be incredible. The marinade and sauce have SO much flavor. Thank you so much for all your incredible recipes! Every time I make something from your site, my husband always says that he loves it. And he’s a super picky eater. Thank you thank you! What an incredibly wonderful comment to start my day off with! Thank you so much for your sweet (& happy!) words. It means a lot to me. I’m so glad you and your husband have been enjoying my recipes so much! I always take happy picky eater comments to heart – it’s quite the compliment! 🙂 Ha THANK YOU!